The most well-known disease caused by cotton dust is byssinosis though it is also associated with chronic obstructive airways disease, and very rarely, interstitial lung disease. Obliterative bronchiolitis has never been reported in this setting. We report a 63-year-old, nonsmoker male, who presented with complaints of cough and exertional dyspnoea for 10 years. He had worked in textile industry for 35 years and symptoms had persisted even after quitting. Examination revealed prolonged expiration with expiratory wheeze, and pulmonary function tests revealed severe airflow limitation with air trapping and impaired diffusion capacity. Arterial blood gas analysis showed type I respiratory failure. A high resolution computed tomogram of the chest showed bilateral centrilobular nodules with tree-in-bud pattern and areas of air trapping. A diagnosis of obliterative bronchiolitis induced by cotton dust exposure was established on the basis of the occupational history and the characteristic radiological signs. Bronchiolar disorders are a group of diseases of diverse etiology predominantly involving the membranous and the more distal airways. These diseases are not known to be associated with cotton exposure. We diagnosed a case of obliterative bronchiolitis in a nonsmoker male with 4 decades of employment in cotton processing industry. The case is reported in view of the absence of any previous report of such an association. A 63-year-old nonsmoker male presented with 10-year complaints of recurrent dry cough and progressive exertional dyspnoea, limiting his activities severely at present. There was no history of hemoptysis, joint pains, fever, chest pain, or any constitutional symptoms. Past and family histories were unremarkable. He had worked in the textile industry processing raw cotton for 35 years, but had quit following the development of symptoms. The intensity of symptoms at work and on off-days was similar. The symptoms had continued to worsen progressively even after leaving the job. Examination revealed prolonged expiration and expiratory wheeze. Chest radiography showed bilateral hyperinflated lung fields with low flat diaphragms [Figure 1]. The electrocardiogram showed a north-west axis with a right bundle branch block and poor progression of R waves. Lung function study revealed severe airflow limitation with hyperinflation and air trapping and impaired diffusion capacity. The forced vital capacity (FVC) was 1.64 L (68% of predicted), forced expiratory volume in 1 second (FEV 1 ) was 0.41 L (21% of predicted) with an FEV 1 /FVC ratio of 25%. Post-bronchodilator, the FVC showed a 300 ml and 18% increase over the baseline and FEV1 increased by 110 ml and 26%. Lung volumes measurement by closed-circuit multiple-breath Helium dilution showed a residual volume (RV) of 2.74 L (148% of predicted), functional residual capacity (FRC) of 3.68 L (140% of predicted), and a total lung capacity (TLC) of 4.49 L (105% of predicted). The RV/TLC ratio was 61% (179% of predicted). Single breath diffusion capacity for carbon monoxide (DLCO) was 14.3 ml/min/mmHg (69% of predicted). Pulse oximetry showed a saturation of 90% on room air at rest. Arterial blood gas analysis showed moderate hypoxaemia and mild metabolic alkalosis (pH 7.45, PCO 2 45.9 mmHg, PO 2 58.6 mmHg and HCO 3 − 33.6 meq/L). A six-minute walk test resulted in further desaturation to 84% within 1 minute. Serum rheumatoid factor, antinuclear antibodies and cross-reactive protein (CRP) were in the normal range. A high resolution computed tomogram (HRCT) of the chest showed bilateral centrilobular nodules with tree-in-bud pattern and areas of air trapping [Figure 2]. A diagnosis of cotton exposure-associated obliterative bronchiolitis was established based on clinical features and occupational history, a highly characteristic HRCT picture and supportive evidence on lung function testing. The patient was advised treatment with inhaled corticosteroids, inhaled long acting bronchodilators (formoterol and tiotropium) and pulmonary rehabilitation. Obliterative bronchiolitis is an uncommon and severe form of obstructive airways disease involving the small airways. Its diverse etiologies include smoking, collagen vascular diseases, inhalational injury, certain drugs, and organ transplantation. Known inhalational exposures include chlorine, ammonia, oxides of nitrogen, sulfur dioxide, and other gases besides diacetyl, a chemical used to provide butter flavor in many foods. However, it has rarely been reported in association with organic dusts but never in relation to cotton-processing industry. 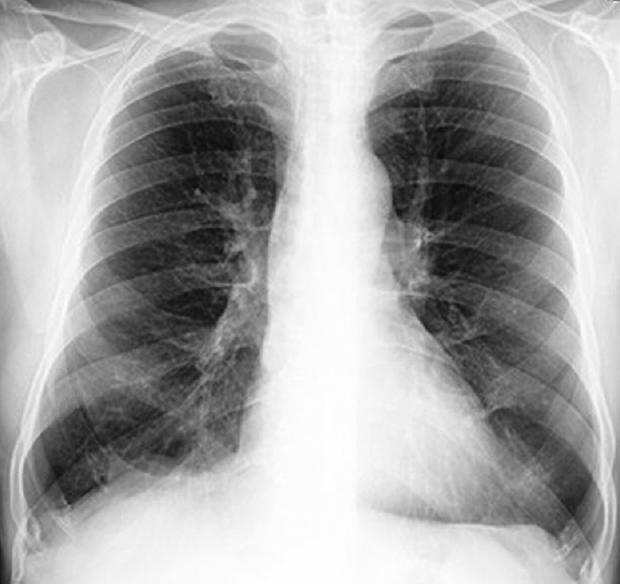 While symptoms, plain radiological features, and the spirometric abnormality resemble those seen in COPD, it is the radiological signs that differentiate the two. Direct signs of bronchiolitis obliterans include ill-defined centrilobular nodules and tree-in-bud opacities whereas indirect signs of small airways disease include a mosaic pattern of attenuation (on inspiratory CT scan) and air trapping (on expiratory CT scan). This picture is virtually diagnostic and obviates the need for a biopsy. A fibreoptic transbronchial biopsy was not done in the present case because of resting hypoxemia and also because the yield in small airways disease is usually poor and would not have justified the risk. A histological confirmation by open or a video-assisted thoracoscopic lung biopsy was not considered necessary because the HRCT picture was diagnostic. There was no evidence of other causes mentioned above. Absence of a history of smoking ruled out respiratory bronchiolitis. In view of long occupational exposure to cotton dust, symptoms, characteristic picture on HRCT scan, exclusion of other causes and supportive evidence on lung function testing, a diagnosis of obliterative bronchiolitis-induced by cotton dust exposure was made. The present case adds obliterative bronchiolitis to the spectrum of respiratory diseases known to occur with cotton dust exposure. An HRCT of the chest is recommended in patients working in cotton-processing industry and reporting dyspnea. Schilling RS. Byssinosis in cotton and other textile workers. Lancet 1956;271:261-5. Glindmeyer HW, Lefante JJ, Jones RN, Rando RJ, Weill H. Cotton dust and across-shift change in FEV1 as predictors of annual change in FEV1. Am J Respir Crit Care Med 1994;149:584-90. Kobayashi H, Kanoh S, Motoyoshi K, Aida S. Diffuse lung disease caused by cotton fibre inhalation but distinct from byssinosis. Thorax 2004;59:1095-7. Gothi D, Joshi JM. 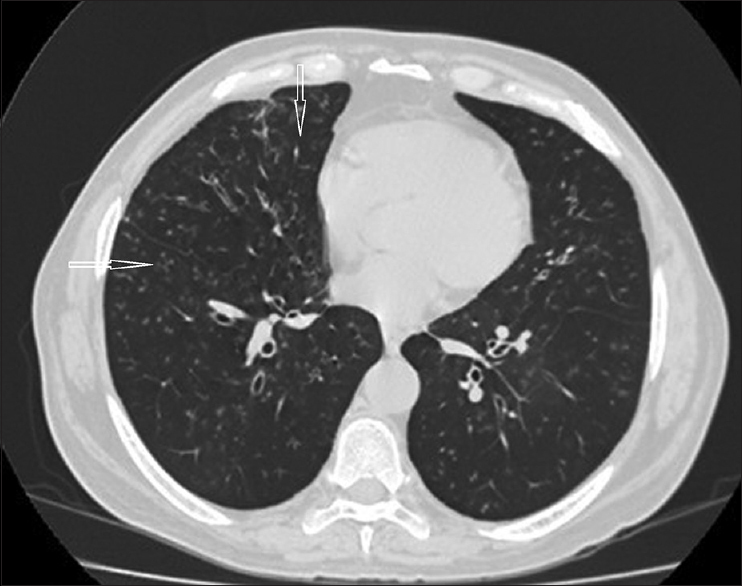 An unusual interstitial lung disease. Ann Thorac Med 2012;7:162-4. Devakonda A, Raoof S, Sung A, Travis WD, Naidich D. Bronchiolar disorders: A clinical-radiological diagnostic algorithm. Chest 2010;137:938-51. Glindmeyer HW, Lefante JJ, Jones RN, Rando RJ, Abdel Kader HM, Weill H. Exposure-related declines in the lung function of cotton textile workers. Relationship to current workplace standards. Am Rev Respir Dis 1991;144:675-83. Fishwick D, Fletcher AM, Pickering CA, Niven RM, Faragher EB. Lung function, bronchial reactivity, atopic status and dust exposure in Lancashire cotton mill operatives. Am Rev Respir Dis 1992;145:1103-8. Barker AF, Bergeron A, Rom WN, Hertz MI. Obliterative Bronchiolitis. N Engl J Med 2014;370:1820-8. Kreiss K. Occupational causes of constrictive bronchiolitis. Curr Opin Allergy Clin Immunol 2013;13:167-72.